Today I am doing The Magic Sword and the Magic Bag (#41). This is a wonderful entry, and is the basis for movies like A Chinese Ghost Story. It is about a man named Ning Caichen who takes shelter in an old temple and resists the seductions of a ghost named Nie. She is moved by his ability to resist her charms and her offers of gold and explains to him that she is under the control of another spirit (in the Penguin edition identified as resembling Yaksha-Demon) who forces her to kill men who take refuge in the temple. There is a wandering hero named Yan at the temple who the spirit is afraid of, and he gives Ning Caichen a magic bag. Ning Caichen decides to help Nie, by digging up her bones at a nearby poplar tree and bringing them for a proper burial near his hometown. When he does this, Nie appears and offers to walk home with him. She repays his kindness by entering the household as his sworn sister. The Yaksha-Demon comes for revenge, but Ning Caichen uses the magic bag to trap it. He and Nie marry and have three children. There are more details to the story than this. It is also one of the longer ones in the penguin edition so it has more room to breathe. For example when Ning returns home with Nie he is married, but his wife is ill, so he initially takes her into the household as a sister and she takes care of his mother. It isn't until the wife dies of illness that she marries him. The story also gets into issues like fate and spends some time dealing with Nie's killings at the temple. For this entry I am going to flesh out Nie, Yan and the Yaksha-Demon. 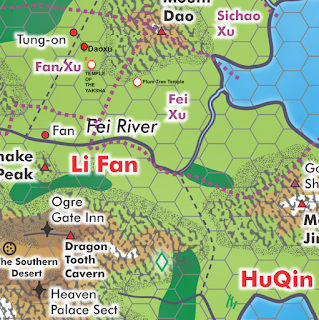 Making an entry for Ning Caichen would get in the way, as his role would be potentially taken up by player characters, either as Nie's victims or her saviors. 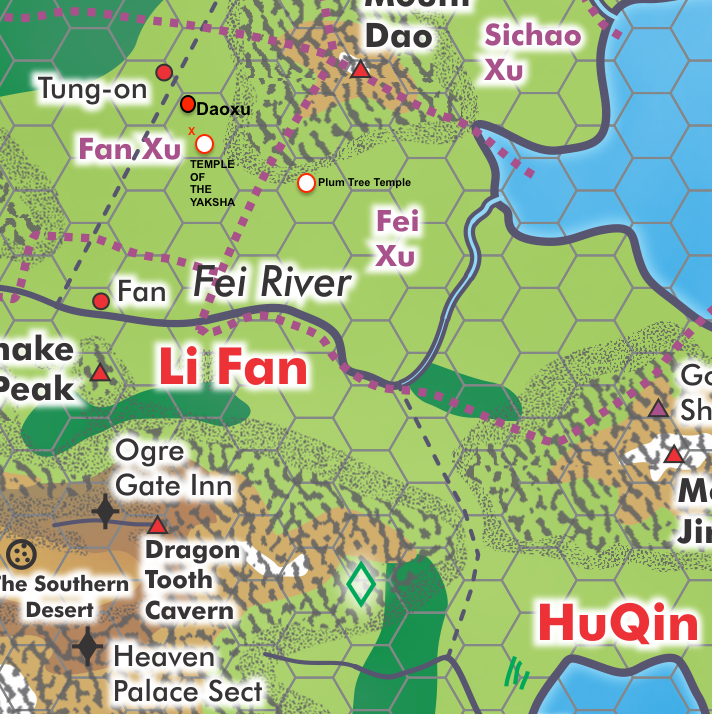 This is a quick scenario involving a temple located south east of Tung-on (near a small town named Daoxu-I will provide a more extended map and scenario for Daoxu tomorrow). The Yaksha Demon escaped long ago from a lacquered box of Plum Tree Temple. The box contains many Yakshas and they begin to die hours after leaving it. In order to survive he must kill one human a night. Initially he did this on his own but his powers grew with each killing and he eventually gained control over other spirits and demons. He has four female ghosts under his control and uses them to kill people in the area so he can drain their life for himself. This adventure is set around the Temple of the Yaksha, where he has Nie doing his bidding. If the PCs come to the place for shelter they find another man camping in one of the halls. His name is Yan and he is a ghost hunter. However he avoids the players and seems focused on his own efforts. Occasionally he spies on them or others staying the night. Other men arrive during the night only to perish in the morning because of Nie. At least one of them Yan watches being killed while doing nothing to stop it. At some point Nie (Little Beauty) will try to gain the trust of one of the party and murder them. But if they resist and or if they talk to her during the attack it is possible she tells them her situation and pleads with them to dig up her bones and bury them elsewhere. If they do this she will repay the favor by treating them as sworn siblings and offering her protective services for 3 years in hopes that this helps her gain merit. The above locations are indicated on the map to the right. The red X on the map marks where Nie's bones are buried beneath a poplar tree. This looks like a lump of gold and responds to greed. Anyone who accepts the stone and keeps it near them when they sleep can become its victim, for it devours the heart of those desiring riches. As the person sleeps, so long as they are within 10 feet of the bone, roll 3d10 Against Resolve. On a Success it begins pulling their heart from their body and drawing it into the bone doing 2 Wounds. When the stone does enough wounds to kill the target, the heart is pulled out. The bone has an Integrity of 16 and Hardiness of 8. This lacquered box is elegant and contains a miniature sword. If you place the box near you when sleeping, it will activate if any demons or ghosts approach, releasing the sword to attack them. The sword has an attack roll of 3d10 and does 3d10 damage to demons. However it can only make 3 attacks each night. This is an old bag, quite small. Yan used to put the heads of his enemies in this bag, and over time it became enchanted. If a demon tries to touch the bag willingly, the bag expands, and the heads form peer out drawing the creature into the bag to contain it. Roll 2d10 against its Evade. On a success it is pulled into the bag and will be contained for 1 year. Nie died near the temple when she was 18 and her family buried her under near other graves to the north. However the Yaksha demon arrived and cast a spell on her remains planting a poplar tree there. If she doesn't kill for him, he causes her spirit to burn. Therefore she kills as instructed using an awl to mimic his method of piercing the foot. However she is kind by nature and wishes to find an escape from her current situation. If she happens upon someone virtuous enough, she will ask them to take her bones for proper burial away from the Yaksha Demon so she can be liberated. Should this happen, her spirit remains in physical form so she can gain merit. Immunities: Nie is immune to mundane attacks and returns one day after being destroyed. She can be laid to rest if her bones are brought somewhere else and given a proper burial. Surprising Strike: Nie prefers to pierce vital meridians when the person is distracted by her charm (usually she stabs an area in the foot causing massive bleeding). In such situations the target needs to make two consecutive Detect rolls against her Stealth or be surprised and take Open Damage. These maidens are also ghosts controlled by the Yaksha Demon (who has placed a similar enchantment on their bones). However unlike Nie they are more malicious and loyal to the Yaksha. Immunities: The other maidens are immune to mundane attacks and return one day after being destroyed. They can be laid to rest by burying their bones safely away from the Yaksha Demon. Heart Strike : The other Maidens throw their daggers from a distance to stab enemies in the heart. Make a Light Melee skill roll against Evade. On a Success they do 4d10 Damage plus 3 Extra wounds. Yan is a Yen-Li Priest of Golden Sword Lineage. He is a ruthless ghost hunter and has been tracking the Yaksha for some time. However he is concerned he might not be powerful enough to confront it so is biding his time, watching it attack others so he can devise good tactics. He knows the demon avoids him out of fear and uses this to his advantage. Yan has a magic sword box and a magic bag for capturing demons. The Yaksha demon looks like a small creature with red skin and black hair, its eyes burn with fiery energy and its long dark claws are well suited for deeply piercing flesh. This creature escaped from a lacquered box at Plum Tree Temple. Since its escape, it began to die, so fed on human blood to replenish itself. This caused its powers to grow an it eventually learned an enchantment to control other spirits and demons by planting poplars by their bones. Devour: The teeth and mouths of The Yaksha of the Temple are large and sharp doing 6d10 Open Damage on a successful bite. Blood Nail: The fingernails of Yaksha are narrow and sharp, ideal for puncturing veins. When they hit with their claws, on a Total Success, they cause the target to bleed profusely (1 Automatic Wound per round until the bleeding is stopped). They can also use this to help feed on sleeping victims at night. Singing Whisper: The Yaksha can sing a gentle melody that lulls people to sleep. Roll their Talent (Singing) against Resolve. On a success the person falls asleep for an 2 hours. On a Total Success they fall asleep for 16 hours. Immunities: The Yaksha of the Temple is only harmed by energy attacks and cold. Plum Blossom wood is particularly harmful against him. Spiteful Burst: The Yaksha would rather die than be captured. He can explode in a burst of burning blood. Roll 5d10 against the Evade of everyone in an 80 foot radius. Those affected take 6d10 Fire Damage (no need for Total Success to function as the blood sticks to anything it comes in contact with). Burning Bones: The Yaksha Demon can place an enchantment on the bones of ghosts, forcing them to do his bidding, provided they remain buried near a poplar tree that he has planted. If they refuse, it causes them to burn taking 6d10 damage. This destroys them if they continue to refuse.